So far in my series on Australia, I’ve covered how I used miles to book my award ticket, my flight from LAX-MEL in United GlobalFirst, and the day I spent wine-tasting out in the Yarra Valley with TPG Managing Editor Eric. For today’s trip report on the land down under, I wanted to share some of the delicious dishes I got to taste while enjoying Melbourne’s world-class dining scene. I’d heard great things about Melbourne’s restaurant scene, but it wasn’t till I actually got to the city that I realized how seriously Melburnians take their food. The city is a melting pot of both Old World, Asian and Indian cuisines, with a healthy dose of “modern Australian” (from what I deduce that means plenty of local ingredients and even some Aboriginal elements) thrown in. The night Eric and I got in was actually Valentine’s Day, and it seemed like the whole city was out on a date. Tons of restaurants were fully booked, and everywhere seemed to have prix-fixe menus in the hundreds of dollars. 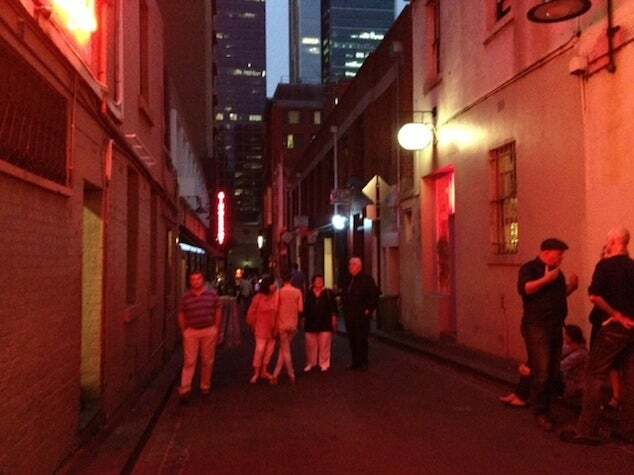 Luckily, Eric and I managed to get a last-minute reservation at one of the city’s trendiest Asian fusion restaurants, Gingerboy, which is on one of Melbourne’s famous alleys, Crossley Street, with a ton of other hip restaurants and bars. The bar downstairs was packed, but we got seated upstairs near the bar in a noisy but fun little area that was sort of like a low, loungey banquette with coffee tables and stools. It was a little tight, but not uncomfortable. We actually had to wait a little bit, so I got a margarita, and Eric got a Thai-inspired drink with vodka, ginger, lemongrass and chilis. 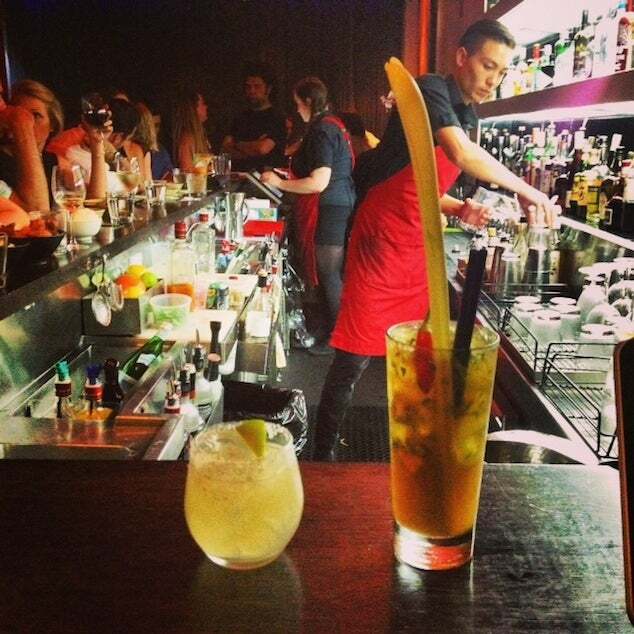 Grabbing cocktails at the bar. When we were seated, our server came by and said there was no set menu for the evening, but he would suggest dishes for us and choose a couple for us. Call me a control freak, but I’d rather just see a menu and know what I’m getting – especially because how is a complete stranger supposed to pick out a meal for you? We asked what he planned on bringing, and after a little haggling over dishes, we put together a menu that sounded delicious. 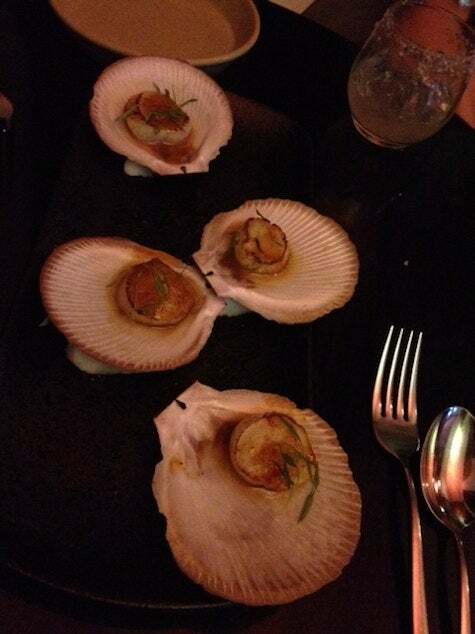 We started with beautiful grilled scallops with ground shrimp in lemongrass sauce served on the shell on a bed of salt made to look like sand. 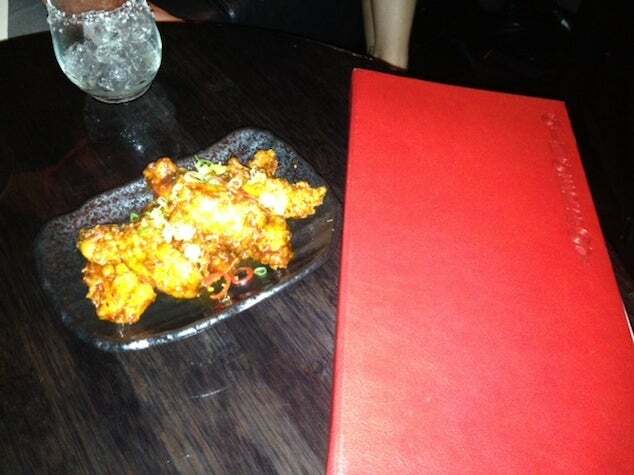 Then we got these Asian-style chicken wings with tamarind sauce, which were tangy and sweet and spicy, and really delicious. 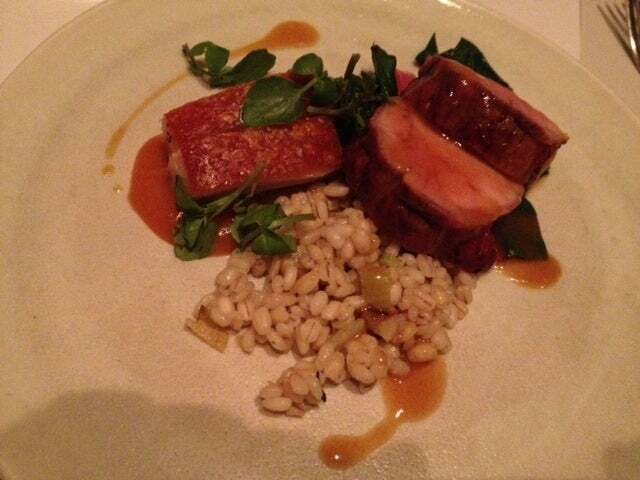 Next up was crunch pork belly with spiced plums and puffed pork crackle. Our main dish was a duck leg in red curry with Thai basil, coconut cream and lychee, which was served with a side of crispy fried sweet corn cakes, which were fluffy and delicious. 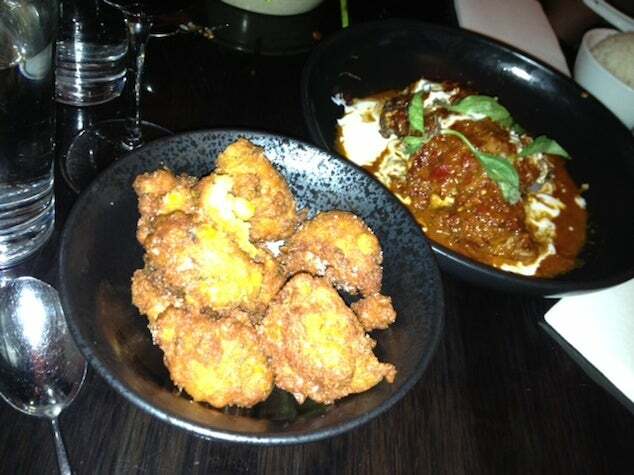 The curry duck and sweet corn fritters. Service was a bit slow since the restaurant was absolutely packed and the kitchen must have been swamped, but our waiter was really solicitous and apologetic for things taking so long and actually took dessert off the price of the prix-fixe menu since we skipped it in order to be on time to meet friends at The Loop, a nearby rooftop bar and cocktail that was absolutely hopping into the wee hours. It turned out to be a fun, fast-paced meal to start off our trip to Melbourne. Moon Under Water reminded me of AHS: Coven. 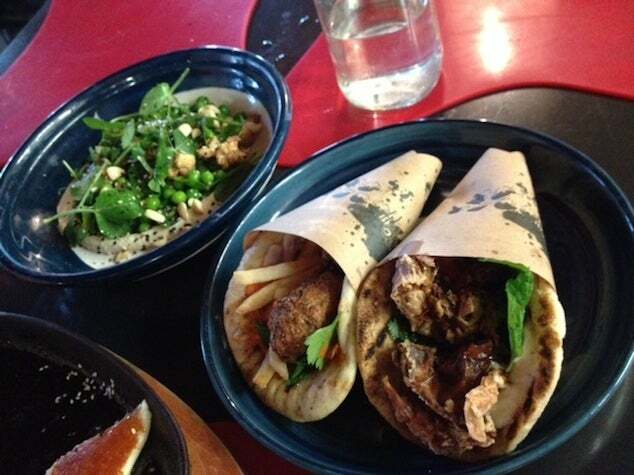 The following day, we spent in the Yarra wine-tasting, but we saved some room for dinner that night at a hot new restaurant on Bohemian-chic Gertrude Street in Fitzroy called Moon Under Water. It’s the latest project from one of Melbourne’s creative, young-gun chefs, Andrew McConnell, and stepping through the bustling front bar at the Builders Arms Hotel and into the white-on-white-on-white dining room (it made me think of American Horror Story: Coven), you can tell you’re in for an interesting, somewhat experimental evening. Eric and I started with cocktails. I got the Ron Collins with aged rum, citrus and ginger, and Eric got the Winston Smith with Woodford Reserve bourbon, Cynar artichoke liqueur and lemon. Both were pretty delicious…and strong! 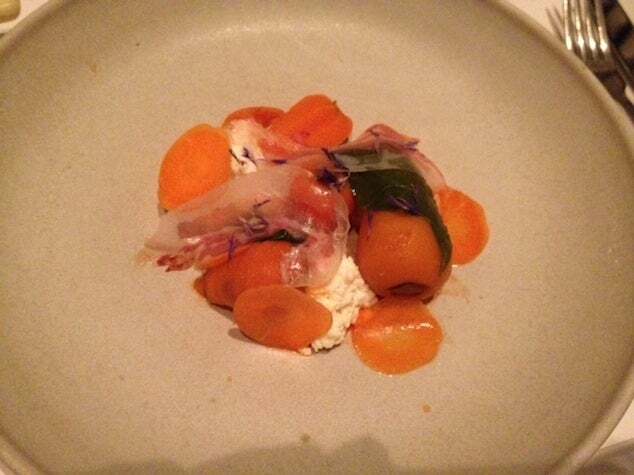 Paris market carrots with smoked ricotta and vinegar paired with Damijan Podoversic Kaplja Malvasia Friulano. The carrots weren’t that interesting. 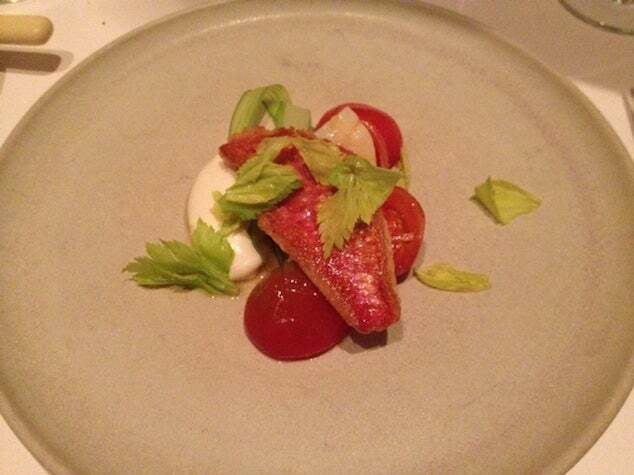 Red mullet, celery greens, tomato and salted fish as the salad course paird with L’acino “Chora” Mantonico from Calabria. 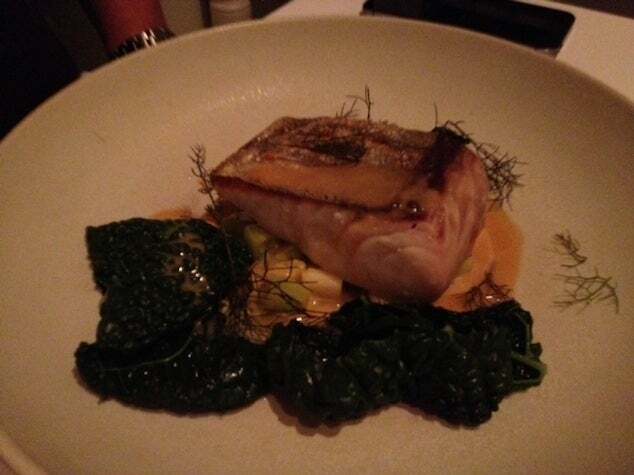 I really liked the savory red mullet dish. Eric’s pork was juicy and tender. Spanish mackerel with miso, wood-grilled leeks and clams (which I got), with NV Verget Au Fils du Temps Marsanne-Chardonnay from Provence. My mackerel was a great piece of fish. 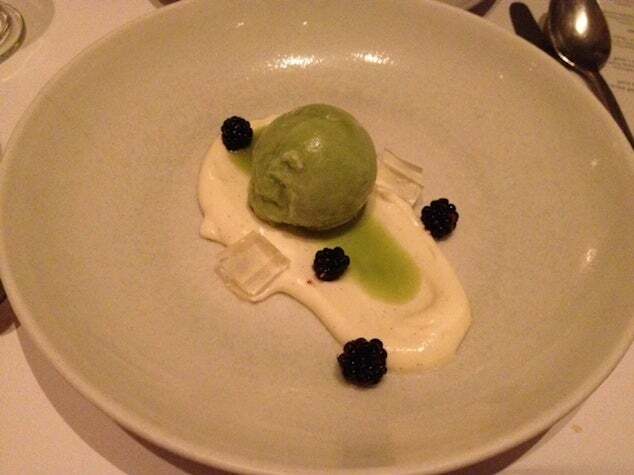 For dessert, there was a creamy goat curd with apple-sorrel sorbet and wild blackberries served with Georg Breuer Auslese Riesling from Germany’s Rheingau. Dessert was fresh and light. 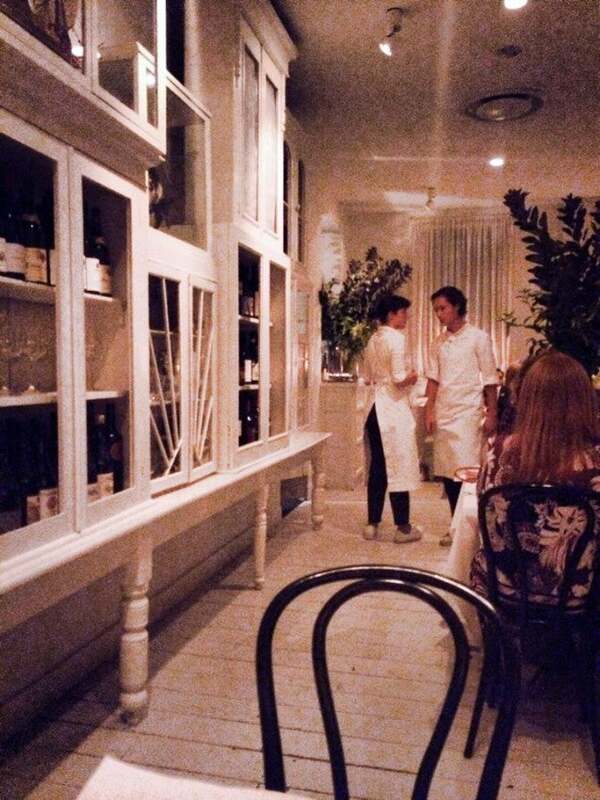 The prix fixe menu was $75 and wine pairings were $55. While the food was delicious and the flavor combinations were interesting (with the possible exception of the carrots, which were just sort of uninteresting and not terribly tasty), the wine pairings were disappointing for both Eric and me. All three whites they served with the savory courses were just sort of over-the-top weird. The first wine was full-on orange in color and tasted almost oxydized, and the second was not that food-friendly. Plus, both were room temperature, which only brought out their stranger characteristics. While the food was delicious – the red mullet dish was fresh and tasted of the sea, and Eric’s pork was juicy and hearty – the wines were just a letdown except for the earthy Sangiovese and the Riesling, which was crisp and acidic but also very fruity and floral – a really nice match to the herbaceous-sweet combination of flavors in the dessert. While an interesting meal, it wasn’t one of our favorites. 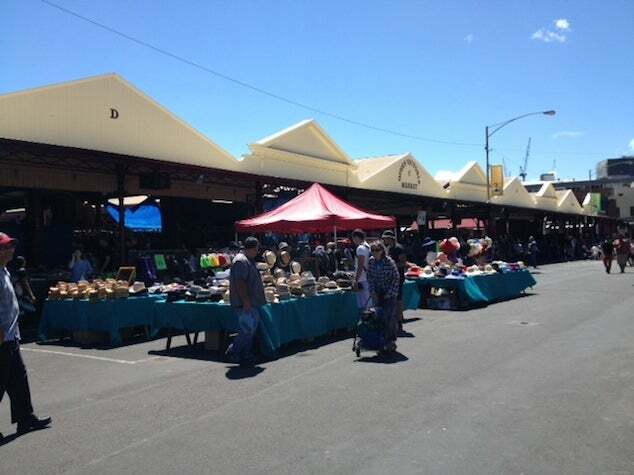 The next day, Eric and I made a quick stop at Queen Victoria Market, a famous food market that was originally opened in 1878 and is the largest open-air market in the Southern Hemisphere, with stalls hawking everything from fresh fish to handmade pasta. It was Sunday, so we got some street food from the carts outside then walked along the shore in the upscale suburb of St. Kilda before heading back to the city for dinner. We just grabbed some street food at Queen Victoria Market. For our last in Melbourne, we decided to switch things up and try a Mediterranean restaurant since the city has a lot of Italian and Greek influences in its cuisine thanks to large former immigrant populations from both countries. We decided to try a newish restaurant called Gazi by local favorite chef, George Calombaris, whose menu principle here is “messy Greek street food.” Reservations can be hard to come by, but there is tons of seating at the bar and at raised communal tables, so we were shown to seats right away. 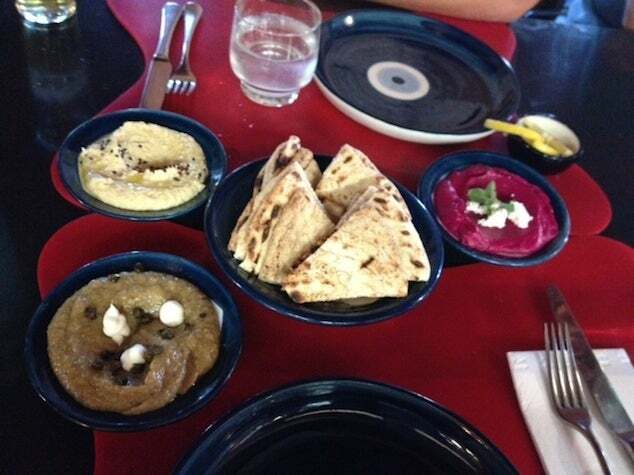 We were starving, so we pulled out all the stops and ordered a ton including a starter of three dips – one with eggplant, another with beets, oregano and feta, and, of course, hummus seasoned with Aleppo peppers, which was among the best I’ve ever had. The hummus was some of the best I’ve had. We continued with small souvas, or sandwiches – one with falafel, fries, parsley and tyokaftiri sauce; and another with soft-shell crab, mint, coriander, honey and mayonnaise. Both were really tasty – I preferred the falafel and Eric preferred the savory-sweet flavors of the soft-shell crab. The two souvas and the salad we ordered. 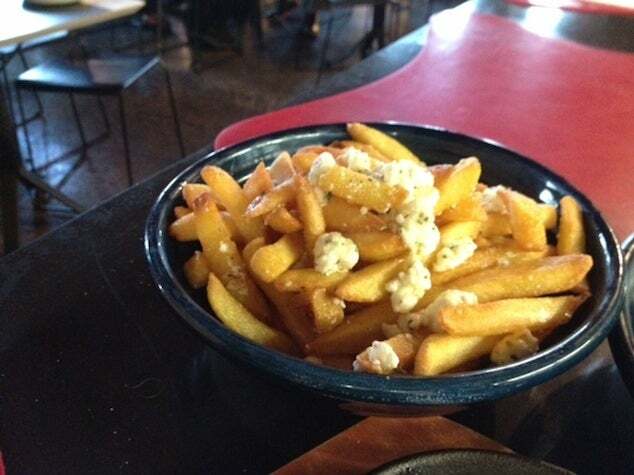 To lighten things up, we ordered a seasonal salad of cauliflower, peas, almond and lemon, but couldn’t resist an order of the fries with garlic oil and feta! 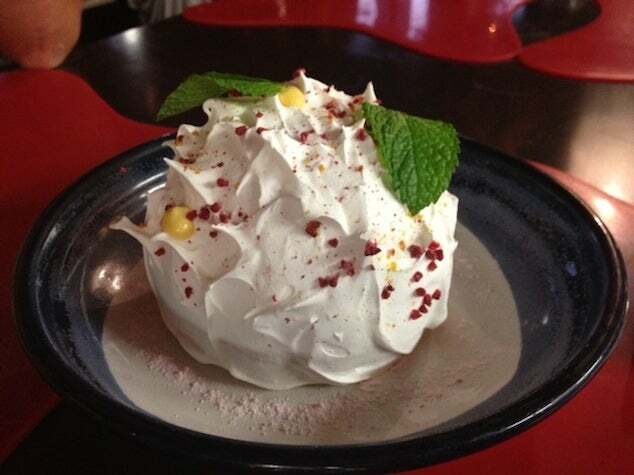 For dessert, I wanted to try an Australian specialty called Pavlova, which is a creamy meringue confection. The one here was a bit “deconstructed” but gorgeous with a meringue shell, passion fruit sorbet, dried rhubarb and raspberry. I had to try a Pavlova for dessert. Though simple dishes, the food at Gazi was really great, and probably among my favorite meals so far in Australia thanks to all the flavors, freshness and the cordiality of the staff. So as you can see, we did a fair amount of eating – good thing I was earning 2.14X points per dollar on my Chase Sapphire Preferred for dining! 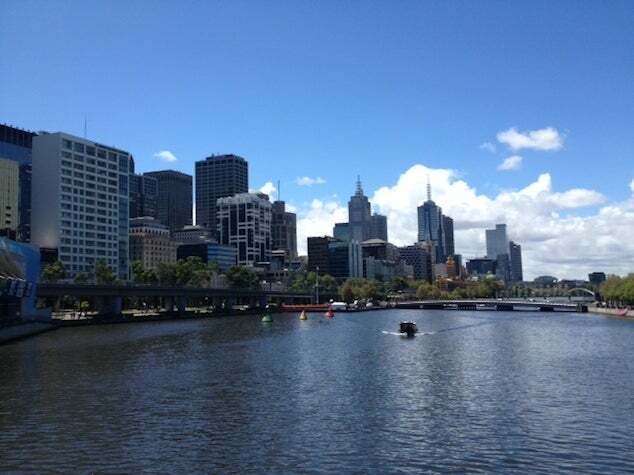 Everyone told me I’d gain weight in Melbourne, and I have to say, I now understand why. Good thing Eric and I stayed so active in Hamilton Island (reports to come) diving the Great Barrier Reef and sailing on Catseye Beach, among other activities. Stay tuned for more trip reports, and if you have suggestions of what to see, do and eat in Sydney, I’m all ears!